There are many tragedies in the Caucasus this month. There are the obvious tragedies of the people of the region. There is the second order tragedy of the stresses on Georgian democracy which will lead to the empowerment of “hardliners”, those invested in border struggles which has led to the Kashmir issue dominating Pakistan or the Eritrean boundary dispute distracting Ethiopia from its democratic development and own route to sustainable prosperity. But there are also two tragedies for western foreign policies as we seek to expand the number of people living safely under the rule of law and the role of the rule of law in arbitrating international disputes. First, we have lost (in this instance irretrievably) an opportunity to decontaminate toxic post-colonial residues, to detonate landmines of political neglect and to create a rule of international law in a complex dispute. Secondly, the word of the United States, which has made arrogant promises it couldn’t keep to the Georgians is now worth less. This has undermined even further the credibility and clout of the United States in the world and despite the schadenfreude which is so tempting, this is not good for the world, as actors like Sarkozy seem to understand. It is a final legacy of the Bush Administration and a reason that an Obama Administration is now the only way U.S. credibility might be restored and, in the language of U.S. electoral politics, U.S. reputation and security increased. There are offsetting optimistic signs, an innovative Finnish foreign minister, Alexander Stubb whose moral role is enhanced by the unique historical role of Finland in global affairs, the continuing ability of Sarkozy-Kouchner to attempt to fill the vacuum of failed American policies in the promotion of democracy, the strong moral presence of the Polish, Ukrainian, Latvian, Estonian and Lithuanian Presidents in Tbilisi. At the time of this writing, though, the story of Georgia is a story of extraordinarily incompetent American foreign policy with great worries for the ongoing promotion of democracy. By its unwillingness to understand how NATO expansion, the bizarre preoccupation with U.S. manufactured missile shields in eastern Europe and the significance of the Kosovo precedent, the Bush Administration left Georgia exposed and raised for another generation the eerie specter of how American undermines its allies whether Kurds in the 1980s, Shia Arabs in the early 1990s or now Georgians. Putin’s Russia is obviously complicated. Putin’s behaviour is worrying, but hardly surprising. His historical role is now almost like that of Napoleon, and will be is as controversial in two centuries time. He has restored a broken Russia to a major place in global politics. He has produced more democracy than ever before and has also allowed a petro-state to develop. Russia has little to thank the Americans for, given their disastrous ‘big bang’ privatizations of the 1990s, but has behaved responsibly enough for a “Great Power” when asked (e.g. on the Iran nuclear file, where Great Power interests have been balanced with a moderately responsible multilateral role). But the key to this crisis is the desperate need of the U.S. neo-conservative movement to invent enemies, turning adversaries into mortal threats and Putin is the target of the day. Abkhazia and Ossetia, like Tibet and Taiwan should have been strategically negotiable. Instead, they were ignored and the Americans encouraged Georgians, who have their own extreme nationalists, to believe they could poke the bear without consequences. In entrenched disputes, right and wrong quickly become confused as lake-bottom mud turns clear waters into murky ones. It is not even with the reinterpretation of history: was William Wallace (Braveheart) good or bad? Was William Tell good or bad? How about Napoleon, while we are on the subject? Entrenched nationalist disputes blur “right” and “wrong”. The only “right cause” in cases like South Ossetia and Abkhazia is a process which produces negotiation and compromise. In Abkhazia and South Ossetia, to the reasonable observer, the Russian case made sense in the abstract. Abkhazians had been integrated into Georgia in a moment of Stalinist cartography with many motivations, none of which were “democratic”. The situation regarding South Ossetia is less clear in legal terms, but, at minimum, South Ossetia was not consulted about its future in the break-up of the former Soviet Union. The landmines of decolonization (discussed in From Durand to Ahtisaari on my website) have contributed to the crises of Iraq and Afghanistan. On the Somali-Ethiopian “border”, the Uzbekistan-Kyrghizstan “border”, and the India-Pakistan “border”, the next generation of foreign-policy makers will confront many more toxic residues of a colonial past. Americans constantly want to fall back on issues of “territorial integrity” as a way to avoid confronting complex historical dilemmas. U.S. foreign policy has always been reluctant to look at the creation of new states as anything other than a last resort. For this reason alone, the U.S. backing of Kosovo’s independent status was an encouraging sign for the new global politics. Even then, the Americans lost an opportunity to put this in a global rule of law driven context. Kosovo was treated as a special case (i.e. “we like these guys”) and the opportunity for the precedent was lost. Abkhazia and South Ossetia have been as distracting to Georgia’s political and economic development as Kashmir has been to Pakistan’s. Since the arguments (viewed from 10,000 kilometers away) are the kind of arguments that all extreme nationalists like to make, it is ironic that in the same month that we celebrate the dispatch of Karadzic to the Hague and the emergence of an independent Kosovo, separate from both Serbia and Albania, this crisis in the Caucasus heats up. If only they had approached Abkhazia and South Ossetia as strategic issues which Georgia could benefit from if they were resolved successfully. This moment has been lost, to the great tragedy of lives lost in the last week. It also is the political tragedy of the embarrassment suffered by the inspiring heirs to the Rose Revolution in Georgia. If western democracies fail to confront how we got into this mess, we face a prospect of the worst of both worlds. On the one side, we have a Georgian nationalism fed towards self-defeating extremism because the Americans over-promised and under-delivered. On the other side, we have a Russian arrogance being empowered because no one took the legal claims of Abkhazia to be analogous to those of East Timor or Kosovo. This is the final act of incompetence by a U.S. Administration that wanted to do well, but was so limited in competence, intellect and world experience that it almost always made bad situations worse. If there was ever a game-set-and-match argument for the need for a new paradigm in U.S. foreign policy, this is it. In the short term, diplomatic efforts have to minimize the damage. Russian interests in South Ossetia and Abkhazia should not be turned into an excuse to destabilize Georgia. The mistake of “building the Georgian military” as a taunt has to be admitted. The accountability of the Russian government for smuggling activities in areas of their now de facto control has to be underlined. The failure of the west to deal with legitimate arguments in Abkhazia and South Ossetia has to be subtly acknowledged. Our commitment to the emerging Georgian democracy must be unconditional; the commitment to the inclusion of South Ossetia and Abkhazia in that new state has to be based on the consent of those to be governed, or conditional. This will require imagination, subtlety, and a great bit of political courage. Most importantly, before we end up having our next crisis next year, people serious about using foreign policy to create a safer and more democratic world should start familiarizing themselves with the details of Ogaden and Kashmir. Maybe these landmines of arrogant decolonization can be detonated relatively harmlessly if we confront them now. Then maybe the rule of international law can start to expand so more people live under the protection of legal principles and not the arbitrariness of the decisions of people long gone like Churchill and Stalin. This essay is intended to address the immediate issues of Georgia-Abhazia-South Ossetia in the context of the dangers to global security created by unresolved residues of 20th Century decolonization and 19th Century colonization. The related, but separate, issue of influencing Russia has to be addressed in a subsequent piece. In seeking to apply rule of law principles, it is clear that Abkhazia sets no precedents for the Russia-Baltic State relations. In realpolitik, this argument has to be reinforced and the consequences of cyber-intimidation, energy blackmail and the deviation from the rule of law (as it is manifested in the BP case) have to be confronted. The market response to BP is a first level warning. The superb piece by Chrystia Freeland in the Financial Times on August 22, 2008 makes an innovative leap on how to influence Russia by de facto a mix of market signals (disinvestment) and oversight of the Russian oligarchs who have a stake in globalization and integration. As we sort out these relationships and learn a foreign policy technique which influences Iran, China, and Russia as opposed to intimidating them, Freeland’s piece will stand out as one of the clearest statements of a new approach to foreign policy. Nothing in this essay should be read to suggest that Russia doesn’t need serious “influencing”. The Abkhazia-South Ossetia disputes are not the best place to convince the next generation of Russians that global rule of law is not just superpower intimidation by another name. The obvious issues of nation-building and the need for a permanent peace-making police force without which there can obviously be no democratic stability and prosperity. The need for academics to focus on the issues of From Clans and Tribes to Markets and the transformative institutions required to do this. The necessity of confronting the issues of democratic self-determination for Somaliland and recognition of incubators of democratic process in the international community. The importance for a (very) long term focus on Northeast African economic integration, to share prosperity that comes from many source, including the discovery of oil in the Ogaden (the Somali-speaking region of Ethiopia). Such a long-term, resumed “trusteeship” is required to return Somalia to good governance. That implies a new rule of law, whether under sharia or, preferably, under the mixed system that the transitional regime seems to support. It also requires jump-starting the country’s ruined economy, refurbishing its schools and almost non-existent health system, opening airports and harbours and building roads – while the same time nurturing greater political freedom. At some point a fully participatory meeting of clan elders and other leaders should be convened to chart and charter the political future of Somalia. Traditionally, Islamic finance has been widely thought to be against the use of interest-based transactions such as those provided by mainstream conventional banks. Rather, Islam seeks to promote the idea of partnership-type structures, where depositors provide money through a bank or other institution and borrowers use that money for investment purposes. Profit or loss from the investment is supposed to be shared between the provider and the borrower, with the bank charging a fee for managing the transaction. Other obvious prohibitions include investments in anything considered a vice under Islamic law, such as pork, investments in hotels where alcohol is served and outlets for gambling, as well as businesses involved with the trade of arms. It is worth recalling that, in the spring and summer of 2005, a broad coalition of civic groups, clans, Islamists, women’s groups and businesspeople in Mogadishu briefly succeeded in eliminating militia roadblocks in the city, in what was described locally as a “people power” initiative to bring public safety to capital. Likewise, in the first half of 2006 Mogadishu-based clans broke with their “warlords” and supported the Islamists out of frustration with the criminality and lawlessness those militia leaders fomented. This suggests an intriguing pattern — namely, that leaders of whatever stripe whose policies produce insecurity for their constituencies are now quickly losing the support of the community. Business and real estate investments in Mogadishu have grown considerably in the past decade, and may be producing a strong preference on the part of investors to avoid instability and war. In sum, the Mogadishu of 2007 is not the Mogadishu of 1993. If this evolution of interests “from warlord to landlord” continues to occur within Somalia’s commercial, political and traditional elite, and if potential external spoilers can be convinced to allow real political dialogue to proceed, Somalia may yet emerge from its long nightmare. I am very committed to Somalia, a place I have never visited. It is partly because of friendships. But it is also because of the need to recalibrate the foreign policy of democracies towards areas where international neglect and the selfishness of geostrategic realism has produced negative consequences. It is also opportunistic, because this is where Canada can do some good, adapting abstract principles of nation-building to the practical demands of solving complex social and political problems in the 21st Century. The exercise of Iraq obscures the successes of Sierra Leone and Liberia. The issues that underlie all these areas are with us today. The challenge is one that is important because Somalia, as Afghanistan, Iraq, Sierra Leone, Liberia, Kosovo, Darfur is intrinsically important, but also because it is a test of a new style of Canadian foreign policy, one which does not hide behind abstract and well-intended principles of internationalism, but one which seeks to deal with the problems of the world in a tough-minded manner. Innovate in the creation of educational institutions which provide the kinds of policies which can bring sustainable prosperity to an area like Somalia. Show that we understand the relationships between capital market innovation and prosperity in countries like Somalia and reflect this in our international development policies. I learned from my father about the residue of European colonialism and the injustices done by making the battles of European proxies somehow the moral currency of international law. From Biafra, Bangladesh, Northern Cyprus, to Somalia, the Ogaden, Baluchistan, Kashmir and all the unresolved issues of the early 21st Century, the convenience of European powers produced a situation which produces complex challenges to practitioners of 21st Century foreign policy. The questions have become more intense since the extraordinarily ill-concocted (and semantically oxymoronic) War on Terror. What are the legitimate options available to a Tibetan nationalist or an Uzbek democrat or an Ogaden Somali or an Igbo nationalist in the new world order? What are the appropriate ground-rules for political mobilization? It is to the credit of the Harper government that the extraordinary rendition of a Uighur-speaking Canadian citizen from Uzbekistan to China is being challenged. The rest of our lives will be spent disentangling communities from the residue of the past and extricating individuals who civil rights have been abused as an historical convenience. For these reasons alone, the future of northeast Africa is paramount. The vicissitudes of European history should not lead to a justification for the realpolitik of 2007. To foreign policy makers, the challenge is: what is an Ogaden Somali who made no consent to live in Ethiopia to do legally? What are the citizens of Somaliland or Puntland to do? How are the resources and heritages of this region to be organized in a manner that provides an opportunity for sustainable prosperity? For Canadian foreign policy, these issues are of great moral relevance. The change from the Trudeau notion on Biafra that all states are frozen in some kind of amber regardless of the legitimacy or illegitimacy of their formation, to the post-Bangladesh recognition of a realpolitik-driven redrawing of boundaries, to the statement of democratic principles embodied in the Clarity Act of 1997 in Canada shows the importance of Canada’s voice on these issues. Our first foreign policy duty is to articulate a Global Clarity Act which establishes the circumstances and processes under which communities can reorganize their post-colonial political circumstances. Without this, the 21st Century will be an endless replay of the attempts to reconstitute viable political entities from a world which colonial administrators in Brussels, Paris, London and Rome created. The second task is to create a framework for regional economic integration. The only way that complex sovereignty functions in this multicultural planet is if we create new instruments for collaboration. It is not just a Marshall Plan we need for Africa. It is a Monnet plan. The Marshall Plan is about capital formation; the Monnet Plan is about efficient use of capital once formed. Economic integration is a prerequisite to democratic transformation. The complexity of the oil exploration of the Ogaden only makes this issue more urgent. The strategic objectives of economic integration and capital market formation meet the practicalities of globalization and the development of corporate vehicles to explore and commercialize oil resources. Malaysian and Swedish companies have to work with the Ethiopian government on Ogaden oil. The profits from these operations require that international investment banks and multilateral development agencies ensure that this commercialization produces benefits for the entire region. Without the establishment of some transnational vehicle for investing profits in economic development (a Horn pension trust), oil will be again a curse which exacerbates the post-colonial geographies of the region. We can do far more to train armies in Africa. The deal we offer African presidents should be along these lines: You run a country cleanly and tolerate dissent, and we’ll help ensure that no brutal force come out of the jungle to create chaos and overthrow you. (“Aid Workers with Guns”, New York Times, March 11, 2007). In the real world, we have already accepted the notion of incubated democracies or peaceful fortresses. In countries like Pakistan, we accept that there is modern, globally-oriented elite which makes Lahore a potentially prosperous place to invest. The geopolitics of the 1980s and 1990s made the incubation and containment approach unrealistic post 2001, putting extraordinary strains on the Pakistani elite. In Somalia, there are geographical pockets where efficient capital markets and collaborative rule-of-law based decision-making might be incubated. One hopes that one moves out from there to create the potential for expanding the scale of this zone of prosperity. At minimum, it must not be contaminated by other kinds of activities. The construction of peacekeeping forces which permit the development of prosperous zones of activities without resolving all external sources of conflict brings to mind the 60-year effort to create co-prosperity initiatives in Jewish and Arab Palestine, a challenge we are still trying to meet. Israel is, at one obvious level, evidence at what an incubated free market can accomplish in a region, which, if it became part of a Palestinian-Israeli zone of economic prosperity could serve as a significant economic development model. (The Peres Centre and the Aix Working Group are templates for this kind of vision). The tasks of building functional arrangements between clans, tribes, organized interests around state operations remains one of the great challenges of contemporary political science and public policy. In Canada, we are still experimenting with models of coalition-building between regional interests. The controversies about globalization and economic modernization confused much public policy discussion in the 1990s. The controversies about global security and counterterrorism strategies have preoccupied public policy discussions in the early 21st Century. Somalia provides, not in some laboratory sense, but because of its unique history and potential role, an opportunity for a more strategic policy-making and institution-building than before. The international community has learned from successes in Sierra Leone and Kosovo, and the challenges in Afghanistan. First, we need to disarm private militias which require a courage and a military discipline from peacekeeping forces. While the Nigerians and Ugandans have played a courageous and self-sacrificing role, there is no doubt that we need a permanent peacemaking capability to deal with situations like Somalia. Without policing, there can be no prosperity. Second, we need to invent incentives for coalition-building. That is why models of economic integration are so important. Tigre-speaking northeast Africans and Amharic-speaking northeast Africans have to be incented to participate in projects. All forms of collaborative institution building are beneficial in this regard. An Ethiopia and Eritrea World Cup soccer team, a northeast African soccer league, a music label that built across linguistic groupings are all private sector and social entrepreneur backed concepts worth pursuing. But at the end of the day, the preconditions for sustainable prosperity rest or fall on a rule of law based legal system which agrees on the process by which disputes are resolved, and an efficiency-oriented capital market which gives all players an incentive to participate in economic growth activities. This will take a while, but the blueprints do exist. The incentives for global security require that these activities take place as rapidly as possible, without creating distortions as individuals and small groups use the power of a post-colonial state to consolidate financial advantages and privileges. Economic growth is not simply a western or Chinese of Indian concept; it underlies human activities and the application of intellectual capital to commerce. By bringing together economic talent in northeast Africa in a single location, like an IMD to bring Swiss, German and French business minds together, Canadians could play a significant role in creating the preconditions for global prosperity. A business School, located in northeast Africa, modeled on IMD, inviting participants from all the cultures and clans of northeast Africa and designing a curriculum which not only linked talented young Somalis and Ethiopians to global leadership, but which was customized to the unique situations of northeast Africa and its specific requirements for institution-building is well worth the time spent designing it. Canadians have to focus our foreign international development activities on things we do well and can export. Concentrating our expertise in managing the global economy and in creating the preconditions for entrepreneurial growth is a worthwhile CIDA initiative, more focused and disciplined than much of our international development activity. The 1970s produced a generation of academics who believed that statistical analysis was objective and removed the universities from the complex interaction of ideas, interests, strategies and coalitions which are the ingredients political change. I am greatly encouraged by my sampling of new thinking in academic life as I have started to read the work of people whose ideas were formed in the 1990s and 2000s. There are some extremely important themes that can only be addressed from universities and intellectual communities like the Centre of Developing Area Studies at McGill. The work I will call “Beyond Clans and Tribes: Citizenship and Social Capital in a Global Society” can only be done by a mix of thoughtful people, oriented towards issues like “nation-building” or “civic institution-building” in Somalia. Only then can we overcome the specialization and over-quantification of issues which has made most people outside the bubble of the university highly skeptical about the value of much of the “research” done in politics, economics and business. In looking to the future, Beyond Clans and Tribes requires that political scientists understand the incentives to cooperate in search of a greater good, growth patterns, integration into the global economy, the elimination of insect-born diseases, the construction of distribution systems for medical care. Task-oriented and result-oriented initiatives build functioning organizational systems. That is what we have to concentrate on. A customized curriculum at a NE African B-School would have a customized curriculum on From Clans to markets. The design of these case studies alone is an exciting project. From this project, we need to develop a new approach to building political institutions: one which creates incentives to build alliances beyond clans and tribes. Why do Slovakia and Slovenia work today despite all the dire predictions a decade ago? In significant part, it is because they built social capital , the community values which fostered democratic institutions. In addition, the excuse of blaming someone else for economic and social failures was removed. We need to approach institution-building in Shiva Iraq, in Somalia and throughout the world with a similar logic. Our first task is to build social capital and organizational systems that produce focused results. Somalia is a good place to start this process and Canada’s role in Somalia requires that we facilitate this. The development of economic models that are appropriate to the region remains a test for strategic decision-makers looking at the Horn of Africa and NE Africa. It has taken half a century to develop models of economic integration in Europe which have produced business models for cross-border investment. But there is a way that a customized business school could facilitate economic integration and open markets. To arrive at this political destination, the international community has to develop a serious strategy for moving from clans to markets. This will require sustained infrastructure investment and the type of concerted policing activity called for in Robert Rotberg’s Financial Times piece (reproduced below). Without that commitment, there is no point of talking about economic integration and Ethiopian and Somali capital market structure innovations. The cost of even doing East Timor has proven to be a test of international resources. The permanent policing infrastructure required for Somalia requires the contribution of Canadian, NATO but also Indonesian, Malaysia, Chinese, Indian activities. The need for a global peacekeeping force was made apparent by events in Afghanistan before Darfur and before the events in Somalia. I opened with three quotes from articles, Rotberg’s excellent analysis of the need for innovation in global peacekeeping, Bokhari’s perceptive Financial Times article on the need for an Islamic MBA and the role of the Gulf States in promoting such an exercise, and Menkhaus’ analysis of the current situation in Somalia from www.harowo.com . There is the ingredient here for a strategy. Capital formation will be easier to do in a stable Somalia than in an equivalently stable Afghanistan because of the role of the Somali diaspora in remitting cash from Italy or Canada or the UK. The challenge is to find ways to make remittances a more predictable source of investment capital, and in the case of a sharia law society, to do it in the manner of private equity or venture capital firms. These are starting points. Somalia is a challenge to the world conscience. It may be the 21st Century equivalent of Italy, integrated, but highly regionalized a century and a half after the Risorgimento. Somalia might end up like the German-speaking countries of Europe, with Somaliland as Austria, and Puntland as German-speaking Switzerland. Somalia may end up like Congo, but its geography makes it unlikely that western governments will accept that. Ken Menkhaus’ February 13th analysis of the situation in Somalia has been extremely helpful to me in the formation of ideas for this speech. An earlier essay on Somalia appeared on my website. A critical view of the role of the Ethiopian leadership under President Meles by Paul Wachter appeared in the Nation. On the complicated issues of the role of the Ogaden in North East African politics, the Ogaden website contains much information. U.S. foreign policy and Canadian responses to it will enter a new stage post-Iraq. The tremendous mistakes of U.S. decision-makers vis-à-vis Iraq were not based on their bad intentions as so many would like to argue. They were based on a tragic mix of obsolete assumptions (Cheney and Rumsfeld formed their views in the 1970s) about the post-Cold War arena and U.S. lack of self-awareness about its rule as the sole superpower. Fueled by a narrow view of U.S. “exceptionalism”, U.S. foreign policy ignored the virtues of America and emphasized its weaknesses. The U.S. spirit makes Bill Gates a role model and a hero in Hanoi or Africa , and made Gorbachev seek the managerial excellence of McDonald’s as he tried to overhaul the Soviet Union . This spirit was replaced by the same blundering U.S. foreign policy which had made mistake after mistake in trying to manage South African democratization in the 1980s, Iranian democratization in the 1950s and the Middle East forever. Instead of relying on the things that the U.S. does well (marketing, economic growth-oriented economic strategies, the celebration and promotion of entrepreneurship), the United States responded to the post 9/11 world with the things its does badly: a reliance on technology for things that technology is ill-suited to solve, a reliance on military strategies for complicated political situations, an ahistorical “New World” approach to human relations which made U.S. democrats look, at best, naïve. When it is pointed out to American decision-makers that their involvement transforms a situation, that being pro-American discredits actors in Persia or Somalia or Iraq, they view this all too often as a statement of European anti-Americanism. However, if one looks at the French, German and many Canadian views on the Iraq war in 2002-3, the warnings and predictions made by many who were not anti-American and certainly not anti-democratic have proven to be correct. A staggeringly unpopular regime in Tehran has been strengthened by being seen to “stand up to America ”. A terrible situation in Somalia has been made worse by the failure of the U.S. to support the democratically-oriented Baidoa government, or more effectively, to let the Swedes and Europeans do it. The United States often succeeds when soft power in used. It is better at making 20something Filipinos or Bengalis excited about Microsoft than it is about making the preconditions for democracy work in Baghdad or Mogadishu . U.S. foreign policy has now been reduced to being a casual observer of scenes around the world, missing the big story of Somalia , while hundreds of billions are spent on Iraq . Let us ask the counterfactual: if the U.S. and Dubai had spent 10% of the expenditures on the Iraq war on building a Somali ports facility and infrastructure for the economic development of northeast Africa , would the U.S. be more or less secure from the rise of Middle Eastern fundamentalisms? Then let us ask the academic question, why was this argument not possible within the current U.S. decision-making model, a model, which incidentally still wants to discuss issues like an anti-ballistic missile system for continental defense. To use the overused expression, paradigms shift and when one is caught on the wrong side of a paradigm shift, one ends up looking as complete a failure as Cheney and Rumsfeld now do. The mistake of the Democrats and the European opposition to the Iraq war is to see the individual practitioners of the Bush Administration as evil or flawed instead of seeing them as trapped within an obsolete paradigm. The successes of Sierra Leone and Kosovo had convinced the world community that rule of law could be established, genocidal regimes or warlords could be contained and that the nightmares of Srebrenica and Kigali need not be repeated. Liberal interventionism became fashionable as a political short-cut without really being understood in the overall context of post-Cold War international politics. In both cases, U.S. involvement had been either non-existent, or minimal. A new framework for a post-Cold War world had been etched in draft form. Iraq permanently changed this calculation, making interventions in Burma or Dar Fur even more difficult than they would otherwise be. In nation-building exercises, Canadian and other non-American democrats have to understand the rules of nation-building. A Turkmen dissident, Yovshan Annagurban, is quoted in the New York Times as saying: “He (Niyazov) corrupted everything and everyone around him. People at the top as well as ordinary people do not trust anyone and everyone”. Nation-building starts with the invention of trust. If one likes the expression building social capital or civil society, then this is a necessary condition of the rule of law. One must be prepared to delay gratification (invest/save) and trust others (delegate/collaborate) or there can be no democracy. There has to be peace (the restoration of order in Sierra Leone or Liberia ) before there can be markets. The tremendous challenge of nation-building becomes the philosophical exercise of building trust, decision by decision, event by event. What applies to Turkmenistan applies to Iraq . The United States (and its friends) has now a crossroad. The strategies which have the least chance of not working (given where we now start from) are the ones which allow oases of trust to build. The first responsibility of the democratic world is to protect pockets of democracy. Therefore, the first foundation for a new Middle east is to protect the democratic Kurdish revolution. To do that, U.S. troops will have to be committed indefinitely to the Kurdish area where they will reassure understandably nervous (and democratic) Turks about the sanctity of their borders. From a Korea-type presence, the U.S. will, at minimum physical risk to the courageous and disciplined U.S. military, whose sacrifices have to be acknowledged by all of the U.S. friends and allied, significantly increase the chances for stability in the Middle East . Market-oriented and democratic Kurds will establish a prototype of an Islamic democracy. The second task is to create a financial vehicle for the management of Iraq ’s oil wealth. The Clinton-Ensign proposal for an Oil Trust Fund, similar to those that have been proposed for the Gulf of Guinea oil revenues, provides the chance for an economic partnership between the market-oriented elites of Shia and Sunni Iraq and the Kurdish zone. Turning oil revenues into pensions and productive long term investment instruments is a critical need for the entire global economy from Central Asia to Angola , from Madagascar to Brunei . It is essential that this be one of the positive consequences of the Iraqi misadventures. The third step is to remove the U.S. presence as rapidly as possible from the zones of conflict, following the new rule of post-Cold War national building, insulate and incubate democracies. If Shia cities in the south can build and manage sewage and power systems, they have taken the first step toward democracy. The Americans and the British can no longer be blamed for things that go wrong. The fourth step is the security issue for the remaining, predominantly Sunni Arab parts of Iraq . This is obviously the most complicated of issues, but one where boldness of vision is required. If Sunni states ( Palestine , Jordan , Saudi Arabia ) want to have a role in policing this area, then so much the better. This is, of course, the de facto partition of Iraq along the lines that Peter Galbraith and others have advocated. If partition is a democratic choice, then it should be encouraged and it will provide a framework for the development of democratic cultures (societies of trust and effective management) that cannot exist in a fragmented and conflict-ridden society. This is a difficult step and one which creates many complexities as the continued role of the Saudi state should cause more concern to the next generation of foreign policy makers than the Iraq state. For decades, decision-makers have made the calculation that a flagrantly undemocratic Saudi state was a price worth paying for some kind of regional security. That calculation needs eventually to be revisited in the new paradigm before another complicated set of military decisions has to be made in the future. (For the goal of building democracies in the Islamic Middle East, it should have been addressed first. That is water under the bridge, but another word for water under the bridge is a lesson learned). In the short term, however, Saudi commitment to policing Sunni Iraq might be a necessary byproduct of a removal of U.S. forces. The United States is brilliant at many things, but struggles with the complexities of dealing with post-decolonization nationalism. Its unwillingness to focus on the role the Americans had in the construction of the Saudi state and its role in administrating all of Islam’s holiest sites is a form of naiveté which is more than simply ignoring the elephant in the living room. Its inability to see that its involvement weakens democratic nationalist forces (in Persia , in Somalia and elsewhere) because of its less-than-stellar (however understandable) track record in “promoting democracy” during the Cold War are all features of the old paradigm. Friends of the U.S. can hope that the next U.S. President will be able to bring to the international table an instant credibility in multilateralism. The next U.S. President must have a perspective on the world which is formed not from inside the worldview of American “exceptionalism” or military-based foreign policies. The next U.S. President must be prepared to frame a world view which is based on effective incubation and insulation of democratic individuals and groups around the world. It will be a 20-year project to create a political culture of trust in Turkmenistan . It took that long in Korea and Japan , for the record. Barack Obama, because of his heritage and life experience may be best positioned to provide this leadership. His challenge is to turn his brilliance and charisma into a coherent foreign policy view that others in the United States and around the world can work with. If not him, then one of the other Presidential contenders will have to grow into this role in the arena of the Presidential campaign. From this a new approach to U.S. foreign policy must emerge. It starts with understanding the limits of U.S. power, in criticizing not the intentions of the people who wanted to make Basra as safe as Monrovia, or Kabul as free as Sarajevo , but in their assumptions which trapped them in the wrong policy frameworks. It will be easier for Obama, or whoever the U.S. electorate chooses in 2008 if the Bush Administration achieves a limited success in Iraq : a democratic Kurdish area, a Shia state moving towards governability, and an international presence in providing police and security for Sunni Arab Iraq. This wasn’t the right route to get here, but if the lessons are learned about the new world in which we are all learning to act, the sacrifices of U.S. families will not have been in vain. The role for Canada (and other non-imperial democratic states) is to understand our role in building cultures of trust and incubating democratic cultures wherever people choose to make them happen. Canadian foreign policy cannot evolve in a vacuum. To be a good friend to the United States and a strategically-relevant smaller county, Canadians need to specialize on our competitive advantages, like nation-building skills. Canadian foreign policy, like all foreign policies, needs to be predicated on our interests, but we have to be prepared to assist the U.S. in developing a new role for itself in the world, which makes it more secure and more popular. Ethnic conflict within artificially constructed geographical boundaries is now one of the most important topics of international politics. We cannot and should not redraw every boundary, but we had better start thinking about these issues. They already impede economic development and block strategies for eliminating poverty. We need the case law to show that law can compensate for the political cartography of colonialism and that legitimate grievances will be addressed because we want to create a framework of global rule of law. We want to create viable states and avoid the 21st Century specter of Somalia, Iraq and Afghanistan, the collision of globalization and post-colonial political cartography. In 1893, Sir Mortimer Durand arbitrarily decided the border between Afghanistan and Pakistan. There was of course no referendum on its political acceptability to anyone who lived there. The borders that were decided in European capitals define the globalizing post-colonial world of today. In the 21st Century, former Finnish President Martti Ahtisaari successfully negotiated between the Aceh Independence movement and the Indonesian government a workable arrangement. This achievement which many thought would win the participants the Nobel Peace Prize was the beginning of a new process of political cartography and dealing with the residue of colonialism. From Durand to Ahtisaari, the international community is moving in the right direction. But when the Durand Lines of the post-colonial world meet the contemporary realities of globalization, so-called “failed states” erupt into global security issues. Many of the present crises in the world are in significant part problems of political cartography. This is even more the case of some of the crises we can anticipate which are often labeled the crisis of “failed states”. In the next decade, the global community will have to address (among other zones) the questions of Baluchistan, the Fergana Valley in Uzbekistan, and the northeast African borders. When the Durand Line meets globalization, brushfires can become volcanoes. Instead of marginalizing the areas trouble spots, globalization has brought all our histories home to us. One of the challenges of the 21st Century is to deal with the residue of colonialism which limits the development of effective states and capital markets. The significance of failed states goes beyond the issues of terrorism, although that will drive the international security discussion. The epidemiology of disease from viruses in Africa to avian flu emphasizes the importance of functioning institutions on a global basis. In Angola, the need to curtail the spread of viruses has made the poor institution-building and dysfunctional cartography of Portuguese colonialism intensely relevant. The global community has a stake in a well-functioning Angolan state and health bureaucracy. The global community needs an effective Angolan state with the capacity to monitor virus transmission, deliver health care infrastructure and record the traditional medicines which ameliorated these problems in the past. In the post-9/11 world we live in, there is an appropriate world-wide condemnation and enforcement of all activities that are rebellions against recognized authority. The behaviour of Chechens, Tamil Tigers, and private militias in Congo or Somalia is correctly labeled as unacceptable by the community of international law. However, for this stated rule of law to be credible internationally, the next generation of foreign policy makers must attempt to provide a framework for resolution and or management of all the Durand lines which clutter the world map. These residues of colonialism frequently stop the development of “social capital” or effective government required to generate the preconditions for sustainable prosperity in emerging economies. Realpolitik ensures that the global community will focus on “crises”, but international law can attempt to have an early detection system for emerging zones of conflict. We can only acknowledge that and push for a political cartography that, in the best traditions of utilitarianism creates the greatest good for the greatest number and removes as many failed states from the global map as is possible. This required diplomatic negotiation like Aceh and also political imagination in the construction of new state structures, like Catalonia or, increasingly, Kurdistan. We are now in an era where the value system of what Tony Appiah calls “liberal cosmopolitanism” is in clash with simplifiers or fundamentalists, from Beirut to Kansas. All places are afflicted by fundamentalisms that are deliberately simplistic responses to the complexity of our time. The consequences of this response to globalization in a world where there are hundreds of Durand lines and political institutions that fail to create social capital are increasingly serious. “Liberal cosmopolitans” have to accept the reality that in failed states and communities, it is extremely difficult to build “social capital” when politics is about the full-time mediation of geographical disputes between communities. The great successes of liberal cosmopolitan building of social capital, e.g. the Indian Congress Party, are not easily exportable models. In the post-Cold War era, the examples of Slovenian or Estonian democracy-building are more typical. These regimes, both successful, were significantly propelled by a liberated nationalism that was channeled towards democracy. The South Korean model of economic growth and social liberalism is a similarly fusion of a traditional nationalism required for survival channeled into a growth oriented and socially liberal agenda. These have proven to be the more frequent models for creating new areas in the global economy defined by their acceptance of the rule of law and their capacity to channel social capital into the preconditions for sustainable prosperity. The global community knows several things that it didn’t know a decade ago about nation-building, peace-making and the role of social capital in creating the conditions for sustainable prosperity. The political agenda for the next few years is going to require sorting them out and developing a global politics based on that solution. The development of a Chinese, Indian, Iranian, Brazilian, Kazakh worldview on managing globalization is a component of this and will influence whether it is to be done successfully. The world of globalization must no longer be confused with the image of spreading American cultural values. Two decades ago, Gorbachev understandably valued McDonald’s for the way it educated young workers about work ethics and productivity. Similarly, other proponents of a “flat earth” valued Wal-Mart for the way it creates an efficient distribution chain. That era of globalization is past. The next issues on the agenda are what we do with the need to create social capital and political accountability. It is important to demand of BRIC countries (and Kazakhs, South Africans and Persians) that they assume proportionate responsibility for these issues as part of the new multilateral legal system. 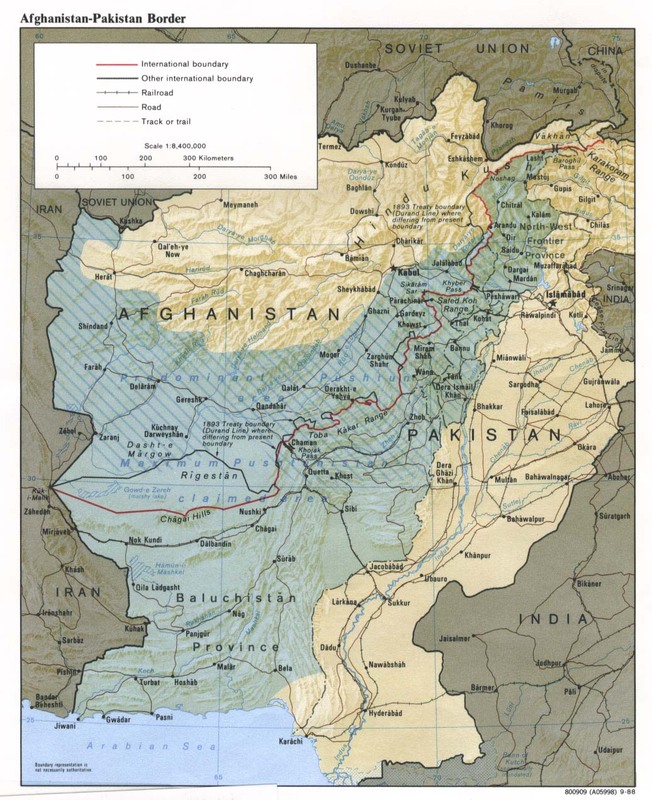 Let’s start with some counterfactual questions which by definition no one can answer: If the arbitrary Durand line were crossed off the map and an independent Baluchistan existed, how would the politics of south central Asia change? Would there be more security in the “northwest frontiers”? Would it be possible to create more social capital building an economy in Baluchistan instead of spending political energies on resisting influences from Lahore or Tehran? Obviously, no one knows the answer to these questions with certainty, but we had better start thinking about them. Durandism, the making of maps which have no sense to the people living in the region has collided with globalization making the world a much less safe place and distracting us from even more important issues, e.g. eliminating global poverty. Creating viable states with successful economies and the social capital required for sustained democracy is a challenge from Slovakia to Georgia and East Timor. It is not just an issue of economic development, but of global security. One size does not fit all, and the solutions for Malaysia are not the solutions for Pakistan, the solutions for Catalonia are not the solutions for former Biafra. Nevertheless, much of the turmoil in the world today stems from not addressing these issues. This requires imagination and flexibility. It requires creating multiple state structures that can manage the oil revenues of regions like the Gulf of Guinea. It is about redesign and innovation within our international political system. The question is how we are to manage these new realities. First, we need to start to ask how we develop functioning institutions in countries held back by 19th and early 20th century amateur cartographers. The bias against microstates is refuted by relatively peaceful countries with internal coherence like Bahrain and Slovenia. The rule of law must work to resolve these issues. What is the rule of law on Northern Cyprus and East Timor and how does the international legal community differentiate the two cases? A little clarity here would go a long way in figuring out how to mitigate the effect of Durandism on the world of the 21st Century by creating a confidence in the coherence and potential of international law. Second, multinational states can be made to work if they are not built on exploitative models. It is a constant balancing act in the architectural design of Canadian federalism to ensure that wealth-production is not constrained by regional politics. For multilingual and multicultural states to work effectively there must be other instruments of what Peter Katzenstein called social coherence in his analysis of Switzerland. In Switzerland, national financial institutions provide the framework in with social capital and common purpose can be shaped. Practical problem-solving starts with finding a few success stories. Peter Galbraith and Shlomo Avineri’s belief in “three Iraqs” and building a progressive, democratic Islamic state in Kurdistan are good starting points for practical analysis. In the long term, we have to look at the legacy of the Durand line, the illegitimacy or telling people to live within borders they had no role in setting, the importance of social capital as a prerequisite for sustainable prosperity, and the insistence that whatever formula is decided from Congress Party to Slovenia, that decision is made democratically. The first step to doing this is to ensure that the rule of international law has a clarity and logic to it as we try to compensate for the effects of the Durand negative legacy without unleashing new tyrannies of parochial chauvinism and fundamentalism. Political realism requires that every case study be understood distinctly. There are attempts to look at situations where minority rights are threatened systematically as in the MAR project, which is a good start. We need comparative politics and case law to be able to talk about this phenomenon. We need creative political theory to define new institutional structures, post-federal and networked to international partners. Catalonia, Kosovo and Kurdistan are differentiated legal and political entities. We need different categories to deal with the aspirations and challenges of Baluchistan, Kashmir, and Northern Cyprus for example. International law and the mobilization of social capital to eliminate poverty are not the only agenda in an era of multiple threats to our security. The role of international law is to ensure that choices are as free as is possible in a world of competing new states and absent a compelling international legal authority. A world in which young Turkish Cypriots, Shan, and Kosovars compare their role in the international economy is something offered by our networked age. When the next generation of foreign policy makers confront security issues, it would be helpful if they are not blindsided by other “Durand lines”. The next generation requires that the skills of Ahtisaari be applied where there are many other Durand lines. We will never eliminate ethnic conflicts, but we can start to try to minimize them. This essay is written primarily for teaching purposes. The issues of developing human rights jurisprudence post-Sierra Leone and aligning it with post-rise of China realpolitik is the challenge for the next generation of international development students. I hope to look at specific case studies to work out a legal theory for international relations after Darfur working at the intersection of international realism, new approaches to “failed” states (i.e. states with no protection of rule of law) and human rights agendas in states with artificial multiculturalism resulting from post-colonial boundaries. Case studies include: (i) the successful Finnish mediation between Aceh and Indonesia, (ii) current Papua-Indonesia relations, (iii), the sale of the Canadian oil company Arakis and the impact of China on strategies for advancing human rights in Sudan and (iv) post-Andijan Uzbekistan. From the empirical discussion of these concrete situations, students will hopefully build on the issues raised in this essay. The most important and exciting work on international economics is being done at the vector of entrepreneurial business, web-enabled commerce and development economics. It is done intuitively by people under the age of thirty who do not operate within the intellectual silos of the last generation. The next vector taking shape is the one between human rights jurisprudence, international politics and web-enabled pro-democracy activism. In April 2006, the Sierra Leone tribunal led by Desmond di Silva’s prosecutorial work and the Arusha trials on Rwanda war crimes has created the framework of a rigours jurisprudence which will be refined and developed in the 21st Century. It will provide a framework for discerning when war crimes trials are the appropriate response to human rights disputes and when truth and reconciliation commissions on the model pioneered by Bishop Tutu in South Africa are the appropriate responses in democratic and moral theory. As the global community deals with Darfur, Burma and Uzbekistan in the post-Sierra Leone global community, this will have significant political implications. In April 2006, a pro-democracy network links the responses to globalization of urban Iraqi youth, post-Charles Taylor Liberians, Rwandans and those who have come to celebrate liberty through the Rose, Tulip, and Orange revolutions of Georgia, Ukraine and Kyrghizstan. The practicalities of an open-source world, where files are shared, experiences learned and refined as web-enabled case studies is already with us, but it requires rigorous analysis to ensure that this does not become a moment of political atonality with no practical implications. In April 2006, the future of the internet is being called into some question by the potential development of a coalition of closed societies, seeking to regulate the anarchic mix of voices on the global web and produce controls, or even a rival internet regulatory capacity, challenging and possibly competing with ICANN. In the next decade, there will be opportunities for a form of open-source accountability to become a defining part of the global human rights regime. It will be possible for a framework of rule of law be available to rule of law activists in Belarus and Burma. It will also be possible for a community of pro-democracy activists to be empowered through the organized social networks of the modern internet society. It is also possible that in this open-source age we will end up with a fragmented internet, with closed societies opting out of the global society and/or an anarchic framework of unregulated gossip, a global tabloid of unverified charges and amateur journalism creating a Babel of incoherence in the way we look at global human rights activities. To make sure that we have the opportunity to build a global internet community that is about real human rights, we need to start having a debate about the next generation of political activism, web-enabled human rights strategies, right now. The role of ICANN and the potential for a rise of a coalition of closed societies: In the past few months, the future of the internet has been brought into question by the proposal to create a competitive structure to ICANN, the overall regulatory authority over domain names. A coalition of anti-openness, including possibly the Chinese, the Iranians and the Venezuelans have started to recognize the power of the internet and a concern that universal openness may be equated with U.S. dominance. The architecture of the new international rule of law and a practical framework for the enforcement and advancement of global human rights requires that the open-source web society that has developed in the last decade not be equated with Americanization. For this reason, one of the most important debates going on right now, with implications for the advancement of a global human rights agenda is the future of Icann. In a world where state power is only one area of influence and government aid an increasingly less significant avenue for facilitating economic growth, the impact of the internet economy going global cannot be exaggerated. Its impact on economic activity is well understood and articulated in the increasingly focused debate about the “digital divide”. However, it will also frame the debate about human rights, about scrutiny and oversight of human rights abuse. It also has the potential to develop mechanisms of transparency and accountability which were not possible before the internet. The Burmese junta, the Iranian mullahs, reactionary sections of the Chinese Communist Party and the equally reactionary caudillo populists of Latin America understand the power of the internet. The chaotic nature of an open source world and wiki-dominated knowledge system often remains in the peripheral vision of conventional political decision-makers. But the technology-literate social entrepreneurs who are defining 21st Century social and economic policy are starting to develop new strategies, sometimes bypassing public policies. Google maps and monitoring water treatment and environmental developments anywhere in the world: It is now possible to map and the water treatment engineering capacities in every village of Somalia with Google maps. It is now possible to network entrepreneurs with microcredit-based business plans. The theory of economic development is transformed daily by these market-facilitating activities. The transformative potential of the web also applies to the area of pro-democracy advocacy and human rights jurisprudence. The wiki and open source world can also be chaotic, unnavigably anarchic and not sufficiently subject to validation of claims. Conventional bureaucrats who want regularized channels will point to web-charlatans, using blogs to advance particular causes, not following conventional journalistic standards of verification and simply being unrepresentative in their views. Conversely, new economy “Wired” magazine readers will point to the rigidity of old economy bureaucracies whether the Encyclopedia Britannica or university research administrators. Both will be right. Both will be wrong. We are in the process of creating a new framework for the global organization of knowledge and information. In that process, we will expand the possibilities of the way we advance human rights law and enforcement of basic democratic values. The lessons of Wikipedia – how to create credibility in open-source systems of knowledge and reliability in open-source systems of information: The development of Wikipedia provides a case study of the strengths and weaknesses of these new strategies. Wikipedia has developed with many minuses, and more pluses. Open-source knowledge may not appeal to people, who want peer-reviewed articles, but collaborative networks of patients are revolutionizing health-care and the wikipedia model has proven a way of demonstrating a wisdom of crowds. The skepticism about expertise is one of the great debates of our time and has to be managed with great care to steer between the rigidities of academic orthodoxies and pesudo-sciences and the anarchy of unverified opinions. The opens-source/wiki model requires constant validation. One of those checks is simply the openness of the open-source system. We want to create a system which combines the rigour of conventional disciplines with the flexibility of open-source. It is also it now possible to pool knowledge and to collaborate on human rights investigation. For this to work, it must avoid becoming a form of global vigilantism or a form of superficial tabloid analysis. If this were to happen, it would produce a negative effect on the governance of societies. The ideal version would be one where the open source communities complemented the existing legal infrastructure and accelerated the changes in the development of the rule of law. The new organization of information means that it is possible to collect data about the atrocities in Sierra Leone and in Rwanda. We are already capable of organizing and collecting stories of atrocities in a manner which was impossible a decade ago. From Mladic to the janjaweed in Darfur, there has been a significant change in a decade. Elizabeth Rubin’s article in the April 2, 2006 New York Times shows the extent that this can be done when combined with the legal rigour and personal courage of investigators like Luis Moreno-Ocampo, the chief prosecutor of the International Criminal Court. What is required, now as in the period before the open-source revolution is the kind of analytical rigour associated with great education. Without this, and a clear debate about what this looks like, open-source runs the risk of being a mix of vigilantism, “Crossfire” soundbites and relativistic analysis. It is possible and it may be desirable to have a global human rights project with a wiki-style discussion of Burma and Uzbekistan about the common issues of building a civil society and an infrastructure for democracy. The legal enforcement of Sierra Leone and Bosnia won't be there but we create an historical record a community of accountability between young Uzbeks and young Burmese and an impediment to the posturing of 21st Century tyrants, exposed by a global openness and a debate. To do that we need a perspective on human rights, a debate about when war crimes trials should take place and when we hand the instruments of justice to the future bishop Tutus and begin peace and reconciliation processes. We know the capacity for new media led change that can come from the activities of a credible and visionary journalist like Pulitzer Prize winner Nicholas Kristof of the New York Times. The atrocities of a single village and the outrages of human rights violations against a young Pakistani woman are now the subject of a global conversation. A large dimension of the new discussion of global rule of law begins online. The debate about human rights, legitimate use of military force and the development of an international security capability have moved dramatically since the British intervention in Sierra Leone in 1997 The debate on the Iraq war has sharpened the focus between those who speak in a language of global security, those who speak in a language of economic realism and those who speak in a language of human rights and the right of every citizen on the planet to live under a rule of law. (1) How universal is democracy and how much an imposition of modern western cultural values? The clash of various realisms and various idealisms on these issues has posed a new dimension to the political philosophy of the early 21st Century. How universal are democratic values is an issue which has been addressed with characteristic uniqueness and astuteness of perspective by Amartya Sen. Can the rule of law be “imposed” by force if a local clan values clan loyalty against outsiders as a trump value? How do we choose when to enforce an international rule of law? Who is “we”? (2) Why was the experience of the Shia in Iraq absent from the moral radar screens of the west in the 1990s? Is it no more complicated than the fact that there was no video as contrasted with Darfur today? The Marsh Arabs were persecuted by someone who had access to oil and have after much tragedy and moral failure been liberated by military action. (3). What is the common law principle emerging from Sierra Leone and Rwanda on the line between a war crime and a civil war situation which requires truth and reconciliation? The superb work done by architects of a new global rule of common law in Sierra Leone, Rwanda is just starting to attract attention in legal theory and political philosophy circles. The Hague trials on former Yugoslavia have started to develop a body of evidence about atrocities and crimes which constitute “war crimes”. But what is the border-line between state-sanctioned ethnic conflict and war crimes? When is the appropriate remedy “Truth and Reconciliation” Commissions and when is the appropriate remedy the application of an emerging standard of rule of law appropriate for an international tribunal such as the one in Sierra Leone? In terms of the borderline between politics and law, when is the judgment that an amnesty or “Truth and Reconciliation” process is politically preferable to a trial the correct decision? The judgments of Chileans regarding the Pinochet regime have haunted international human rights law for twenty years. How does one judge the generals in Rangoon or terrorists in Sri Lanka who have the option of advancing their interests through an internationally-sanctioned mediation process? If the Burmese generals were to leave office tomorrow with their narco-currency generated wealth in exchange for a peaceful transition to a rule of law backed regime, is this a deal which should be sanctioned by global democrats? If an amnesty accelerated the peace process in Sri Lanka, would we still argue that war crimes trials are required because of the abuses committed by suicide bombers? Once again, who are the global democrats who should be making this decision: UN bureaucrats, the government of Finland or India, the State Department in Washington, a committee consisting of Nobel Peace Prize winners, an international court of Justice a committee of international law schools, the editorial board of the Wall Street Journal, the Financial Times, or Rupert Murdoch or some combination of the above. 4. What are the legitimate means for multicultural states to handle conflict? What is the role of international rule of law in these situations? The issues of Biafra and Sri Lanka pose this question concretely and are case studies which should be analyzed intently. The development of a rule of law framework is painstaking and incremental. It contains within it the potential for errors, the potential for trivializing great evil and overpunishing people who reasonably could not be expected to resist social pressures and the intimidation and fear of reprisal which is the real world in periods of civil war and conflict. There are some standards which the trial of Charles Taylor may establish. The person who plays the role of Hannah Arendt as Taylor in Freetown (or The Hague) instead of Eichmann in Jerusalem will probably not see the banality of evil. Instead, he or she will see a network of rationalizations about the nature of civil threats and stereotype of the behavior of people different. Mladic and Taylor’s first clear evil is that they used state power to effect great suffering. The Andijan citizens confronting Uzbek soldiers, the Kurds at Halabja similarly confronted a state power which saw no checks on its activity. The international rule of law and human rights jurisprudence requires that we aim for a consistency of standards about these issues. These last four questions are the framework if a curriculum for a new jurisprudence of human rights. If there is a vector about political activity involving political science, legal theory and social networking, similarly there is an intellection conjunction between political science and jurisprudence. International law has had a blood transfusion of fresh ideas. The development of a common law of international human rights will come about through case law, through the activities of people like Ocampo in his pursuit of the architects of the Darfur massacre, in the work of the lawyers at the Arusha trials on Rwanda and in the work of Desmond Silva on the Sierra Leone war crimes trial, whose work in the trial of Charles Taylor may be one of the most significant events in political and legal philosophy of the 21st Century. Undoubtedly the internet will transform the way we look at human rights issues even more than it is already. Now, as in so many other areas, we need to develop the tools which turn the internet from a global knowledge-dredging activity and add value through a process of validation and debate. In all information innovations, sooner or later economic power goes to those whose capacity to validate and organize knowledge is established in the marketplace. All those of us who are engaged in knowledge creation (media, new media networks, wikis, voluntary associations, NGOs, government agencies, universities) have to have answers to these issues. This applies to the standard-setting blue-chip media, who are even more important in the cluttered of an open-source world where brand is the only shortcut. For the Financial Times, the New York Times, the Wall Street Journal, McGill Law School, Harvard, and MIT, these questions have to be addressed and worked through. As the line between university, blue-chip media and wiki starts to converge, this will have real ramifications for the way we discuss and teach democratic values and the rule of law. Already an inventory exists, documenting activities in Darfur, Sierra Leone, Rwanda. We can construct a map of Darfur villages and janjaweed militia movements on a laptop with Google Maps. What we cannot do is ensure that our knowledge management capacities enable us to ensure that the human rights questions which rightly preoccupy the next generation of political idealists can receive an effective organization of data which sets priorities. Perhaps it is a brand like the Bill and Melinda Gates Foundation, the New York Times and the living Nobel Peace Prize recipients backed by a secretariat that provides resources and infrastructure. It starts, however, with universities and law schools asking the right questions about international politics and human rights jurisprudence. It continues with the use of the new social networking software and skills of the internet to organize data of human rights abuses and to share it in a way which empowers often isolated human rights advocates. The power of Transparency International to shed sunlight on previously obscure corruption in various parts of the world augurs well for a web-enabled human rights agenda. The power of web-enabled human rights jurisprudence to provide a similar standard and record also exists. Ensuring that the internet has universal acceptance has become a top priority for advocates of a global rule of law. Human Rights Watch has already started this process and the development of organized data on unacceptable activities around the world has increased exponentially since the international anti-landmines movement demonstrated the power of information technology to affect public policy. The next stage of international human rights jurisprudence is to organize the open source accumulation of case studies and stories and to create a rule of law backed set of criteria for future enforcement. Politics remains an indispensable component of effective enforcement mechanisms. Kristof’s political strategy for an international force of Bangladeshi, Moroccans and other Muslim troops in Darfur is recognition of the political context of human an example of the recognition of the political context of human rights jurisprudence. With no enforcement mechanism, there is no meaningful rule of law. Without political consensus, there is no enforcement mechanism. The borderline between law and politics is one of the templates of democratic theory. Contemporary human rights activists are the map makers for this borderline. The emerging global debate over the Iranian nuclear programme has revealed the vacuum of western policy towards Iran. Fareed Zakaria’s highly useful piece in Newsweek (January 30th) argues persuasively that many boats have been missed and that the tactics required for minimizing the threats of a nuclear Iran require different approaches than the approaches rehashed from the current foreign policy menu. David Brooks’ piece in the New York Times of January 22nd 2006 argues perceptively that there are four current positions on Iran, none of them satisfactory: pre-emptionists (who would use military force to preempt an Iranian nuclear capacity) , sanctionists (who would attempt to deter Iranian militarism through sanctions) , reformists (who will wait for a better regime in Iran) and silent fatalists (who acknowledge the limited options of an overextended “west” in dealing with the new situation in Iran. There is a possible fifth position, radical pro-democrats, attempting to assist the development of a next-generation cyber-democracy, concerned with the type of regime that exists in Iran and adjusting short term tactics to achieving these objectives. The fifth option obviously requires a careful calibration of designing incentives and deterrents and then constructing international coalitions, but we are on an accelerated learning curve in this global cosmopolitan world. Iran will be a critical test of the global rule of law coalition. The role of Canadian foreign policy in promoting democracy in a new Persia is complex. It is obviously caught in the same labyrinth of competing stratagems and philosophies that underlie the approach of other western democracies. As Canadians, we can overstate our potential influence, the role of soft power, the promotion of Farsi-language film makers at the Montreal Film Festivals, the ties between Canadian and Iranian technologists at Canadian universities, the Canadian track record of supporting dissidents and democrats from Mandela to Havel when that wasn’t the orthodoxy of “realpolitik” foreign policy. But we can also underestimate the role and impact of global cosmopolitanism in backing sustainable democracies in key parts of the world. The politics of contemporary Iran is particularly complicated because Persia has played such a unique role in the last half century of world history. It is a great power that has been locked in an ideological backwater since 1979. The poisoning ideology of that revolution has contaminated the Iranian political culture. The harassment by Iraq since 1980 has further contaminated the culture and this created a new reality with which we must now deal. The global pro-democracy community is now dealing in Iran with the result of these many political wounds that have become infected. The global pro-democracy movement cannot succeed without leveraging the current multilateral international efforts on Iran’s compliance with nuclear controls. Conversely, the agenda of ensuring a peaceful role for Iran in the global community cannot succeed without sensitivity to the impact these negotiations are having on Iranian democracy. In the short term, inclusion of Iran into a multi-power structure to manage the nuclear issue is one way to help empower globally-oriented members of the Iranian political community. But in the long term, the only way to allay the understandable global concerns about the Iranian nuclear programme is to nurture the development of a stable democratic Iran. The tactics are as we all know, tricky. We are forever unraveling the tangled cord of 19th Century imperial histories and 20th Century Cold War “realpolitik” foreign policies. Let us start by trying to untangle these cords. The western democracies missed opportunities to back Iranian dissidents in the 1970s and 1990s. Any future Canadian role has to deal with the challenges of creating and earning credibility for western democracies in the Farsi-speaking world. As in other parts of the world, our own expectations have to be calibrated to be bold but to stay within the parameters of the possible. Canadians and pro-democracy movement are all too aware of how difficult it has been to back democratic movements even in Burma, a country where the geostrategic complexities do not include the specter of nuclear proliferation or in apartheid South Africa where it took a long time to come around despite the current global celebration of the triumph of democracy there. So even with realistically calibrated expectations, what can Canada do about the pursuit of Persian democracy and the development of a role for a new Iran on the world stage? The answer is that we can start to lay foundations, learning from the successes of the African National Congress and the Polish Solidarity movement. Iran could be a success story like post-Ataturk Turkey, Korea, and Japan after 1945, or it could turn out to be like Germany after 1918. Iran is one of the countries where there is a great debt owed by the west, where we have failed in the past to promote the cause of Iranian democracy. Western democrats failed to advocate the cause of democracy effectively under Mossadegh, even as we helped Persians resist Stalin. More recently, western democracies failed to understand the implausibility of the Shah’s regime, failed to find a point of leverage to back the democratic elements in 1979 and allowed the secular Bani-Sadr and Bazarghan coalitions to dissolve into exile and political weakness. Above all, we failed to recognize the huge impact and trauma of the Iran-Iraq war and the, at minimum, negligence of the global community in that period. This in no way exonerates the extremism of the current regime. Nor does it in any way understate the dangers represented by such an extremist rogue regime. However, it does speak to the tactics required to empower courageous and visionary Iranian democrats and lead to the successful democratization of Iran. The political challenge for proponents of rule of law in the global community is one which requires an effort to find an Archimedean point to back democratic forces in Iran. In Somalia, an enforced rule-of-law could contribute to a progressive outcome and dictates the pro-democratic strategy. In Sri Lanka, an enforced peace and a negotiation between groups who are disarmed may produce a Northern Ireland type of best possible outcome and this dictates the pro-democratic strategy. Iran presents a different challenge. Canadian foreign policy can be based on a unique post-multicultural liberal cosmopolitanism, we can provide a role in the educating the international process about the emergence of the new international framework. We can be a moral referee in international frameworks. If once again the differences in the region are not understood as well as differences in Europe are understood, there is little chance of a democracy (America, Canada, Britain) calibrating its foreign policy correctly. On a recent major U.S. news show, the journalist hosting the show talked (not as a slip of the tongue, but repeatedly) about President Ahmedinajad appealing to the “Arab street”. Arab-Persian relations have a history and few Farsi-speakers appeal to the Arab street. It is difficult to create sound public policy in a democracy when there is such widespread misinformation. At minimum, Canada’s multicultural cosmopolitanism provides a grammar for discussing the complex historical relations of the region and promoting democratic values with that grammar. (b) To strengthen the hand of Persian reformers, western democracies have to admit they were wrong in failing to back previous democratic movements: Apologies are an invitation to an endless and counterproductive reopening of history. (“We ask the French to apologize for the Norman invasion” is the ultimate in the inappropriate use of history). Apologies must not be allowed to become a blank cheque for political extortionists or apologists for neofascism. Nevertheless, the treatment of Iran in the global community between 1953 and 1979 and, in different ways, between 1979 and 2005 reveals a failure western democrats should acknowledge. We collectively acknowledged how Cold War geopolitical strategies contributed to the toleration of the apartheid regime in South Africa in the process of rehabilitating the “communist” and “terrorist” Mandela. How else do we communicate to the 25-year olds in the Persian street that we “get it”? (c) The Canadian role in creating a global petro-economy which emphasizes productive reinvestment strengthens the hands of democratic reforms in Iran: We have to use our potential global role in petro-diplomacy and energy diplomacy to include Iran in a collaborative discussion of post-OPEC oil diplomacy. This might be an informal exercise involving Iranian academics and bureaucrats along with Chinese and Indian investors and investor analysts and led by Canadians suddenly self-conscious of the fact that we are the world’s leading energy superpower. As Canada assumes its role as one of the world’s leading energy superpowers, we can develop more strategies to include Iranian democrats in the management of a new global economy programmed to facilitate the development of an entrepreneur-led sustainable prosperity. The more we create multilateral frameworks for deciding issues about global energy consumption and production, the more we encourage and support Iranians with the skills and ambitions to participate in such frameworks. This is reminiscent of the discussion about supporting young South Africans in the 1980s. (d) Canadians can facilitate investment in new public capital markets, like the Tehran stock exchange, which leads to increased pressure for transparency and increased involvement of new capital markets in Canadian projects: Canada’s foreign economic policy can be more involved in creating a multilateral framework for South-South economic transactions that create growth and operate within the rules of a transparent and rule-of-law inspired economic framework. The negotiations that are part of the WTO process and in which Canada has long enjoyed its avenues of multilateralism become suddenly relevant in a world where Chinese investment in Syria, Malaysian investment in South Africa, Korean investment in Uzbekistan and Indian investment in southeast Asia becomes one of the drivers of the new pattern of economic growth. German involvement in the Tehran stock exchange has been a significant new phenomenon in the construction of a globalized and globalizing Iranian economy. The more accountable and well-regulated cross-investment takes place, the easier it will be to create a constituency of support for democratization. As more Iranians participate in this process, the consensus for integration in the global economy will grow deeper. (e) The Canadian support for human rights means that while we are backing the democrats in the new Persia, we have to create an equivalent of the Helsinki protocol to monitor repressive activities in the realities of the present tense: We could create the equivalent of the Helsinki protocol for Iran, working with Amnesty International, Transparency International and over like-minded governments without an imperial history to create a data base of political prisoners and violations in the standards of rule of law in Iran. Sunlight is a disinfectant and simply making the world more aware of events in Iran creates one of the preconditions of a successful democratization process, while western support is at best a double-edged sword, it can be used to empower individuals as the award of the Nobel Peace Prize to the human rights activist, Shirin Ebadi demonstrates. We do not have the equivalent of the Nobel Peace Prize in terms of publicity but in the age of the internet, this kind of focused activity has enormous potential to illuminate and disinfect. (f) Even though we have had trouble figuring out how a G-8 becomes a G-12 or how an L-20 becomes relevant, there is a role for an international grouping to manage nuclear proliferation, the nuclear powers plus Iran. How do we maintain the principle of nuclear non-proliferation now that the global community has accepted the Pakistani and Indian nuclear programmes? How does the New Delhi-Beijing-Moscow role in shaping global policy affect pro-democracy agendas in Iran? The advantage of pursuing such a strategy, similar to the six-power negotiations in the Koreas is that it provides an incentive for responsible Iranian participation and it recognizes the need of having China, India, Pakistan and Russia in a new collaborative framework. It gives Iran a chance to participate, without necessarily having to acquire nuclear capabilities. It also gives internationally-oriented Iranians a podium from which to participate in the international management of nuclear proliferation. Canada’s role in the G-8 provides a standing to help facilitate this. (g) The Iranian world of today is filled with a dynamic emerging cyberdemocracy, well documented in the western press. Like the samizdat of Soviet Russia, it creates a framework for a new regime philosophy. In the short term, the Persian diaspora has to be assisted in backing these positive forces. The role of a democratic foreign policy is to ensure that these forces are known, celebrated and backed. Contributing to the growth of a Farsi-language new media network is an exciting potential role for Canadian foreign policy. As we know from the experience of Ukraine and Lebanon, the role of new media in facilitating the emergence of democratic thought is something which government bureaucracies continue to underestimate. (Some Iran-oriented web-sites are listed below). These are obviously small steps. But they do point in the right directions and they do leverage our advantages. They are the first steps in using Canadian foreign policy to empower Iranian democrats and in starting to play a role in the Dubai to Singapore world where the tides of global economic history are shifting. Our moral principles and our economic self-interest point in the same direction. It is imperative that we do not miss this opportunity as we have missed so many others in the past fifteen years. Canada can articulate a foreign policy based on the principles of expanding human rights, overcoming all forms of racism and sectarianism in an increasingly interconnected and multicultural world and establishing the infrastructure required for democratic choices wherever there is intercultural conflict. We can, at least start. There are a number of initiatives going on in the world, born of European social democratic principles, South Asian non-sectarian democrats, and proponents of a rule-of-law based social prosperity everywhere in the global economy. There is a unique Canadian perspective on these issues. These remarks are addressed to Tamil-speaking Canadians about the future of Sri Lanka and the Tamil-speaking world. When speaking with Tamil-Canadians and people interested in Tamil politics, I often suggest that they look at events in Tamil-speaking Sri Lanka in a global context and understand the unique importance of their activities. By repudiating the violence that has damaged the reputation of Tamil culture, they make a point of global significance in and of itself. Tamil politics will also be influenced by the interconnectedness of the modern world. Events in Kurdistan and Burma will have the kind of ripple effect on Sri Lanka which events in Poland and Eastern Europe had on South Africa two decades ago. Events in Sri Lanka and the Tamil-speaking world will also have ripple effects that will be felt around the world as struggles for the achievement of multicultural democracy seek their inspirational templates. It is important for a democratic movement in Tamil-speaking Asia to put the issues which interest and motivate their political activities in a language of global justice and the global politics of the pursuit of the rule of law and sustainable prosperity. No nationalist politics can exist in 2005 without a global context . It is important to show the connections between seemingly obscure and distant events. Who in 1982 saw the links between events in the shipyards in Gdansk and the changes that would come by the end of the decade in South Africa? The end of the Cold War ended the realpolitik-based defense of the apartheid regime in South Africa. Now today, democratic nation-builders like the Kurdish regime and Iraqi President Talibani will make decisions about how the institutions of a liberated Kurdistan integrate into a pan-Iraqi regime and that will have implications for the Tamils of Sri Lanka. They will set a framework for the management of multicultural states pursuing the rule of law. In global geopolitics, a Buddhist democracy in Burma will have implications for the greater south Asian community from Lahore to Java. A democratic Burma would open up the possibilities for more cross-border investment and for different strategies of south Asian economic growth. That too will have implications for the way in which Sri Lankan politics will evolve. South Africans in 1982-89 could only monitor the events in Gdansk and Warsaw that would within a decade ripple through the interconnected world of global politics. But they could be ready and could understand how global democratization might create opportunities for them. Today Tamil-speakers who want to reconstitute a democratic Tamil politics have to understand how events in Kurdistan and Burma may create opportunities for them. Success will require an understanding of how domestic politics intersect with the global environment in this interconnected world. History teaches us not just of “butterfly effects” and undisclosed connections. It also shows us how events inspire, how liberalism in Napoleonic Spain had an impact on Spanish-speaking California or the Colombian and Venezuelan settlements on the Caribbean coast. Every society in the world is grappling with the complex politics of multiculturalism. And there are lessons to be learned from how good politics and great political leadership can accelerate the end of isolationism and sectarianism in this modern age. We are in 2005 enjoying the possibility of entering a new global political era of democratic non-sectarianism. This is not the time for advocates of human rights and rule of law to take a victory lap, but there are powerful metaphors there for those who choose to see them. Democracy is not something one imposes, but if we look at the activities in Zimbabwe, Burma and Kashmir as of 2006, we know that in Bernard Kouchner’s phrase, “humanitarian intervention” sometimes makes possible the removal of the artificial obstacles to democracy. The Zimbabwean, Burmese and Kashmiri people have all demonstrated a will to a democracy that has been suppressed. Kouchner remains an important political figure, outside of the current power situations www.echofoundation.org , an advocate of liberation of Kurdish democrats among others whose vantage point and philosophical framework is European democratic socialism. Similarly, the speech Harn Yawnghwe delivered on behalf of Aung San Sui Kye to the conference at the University of Virginia is of eloquence and importance to democratic advocates because of its belief in the universality of democratic aspirations and its evidence that there is nothing “western” or “imposed” about democracy. Another Nobel Peace laureate, Jose Ramos-Horta wrote in an article in the Wall Street Journal http://www.opinionjournal.com/editorial/feature.html?id=110005071 challenging the assumptions frequently made about the role of international institutions and what Kouchner would call “humanitarian intervention” in creating the conditions for democracy. The vigour of democracy in these contexts like Bosnia, Burma, and East Timor is remarkable and inspirational. These butterfly effects, or global ripples have implications for the future recasting of constitutional options in Sri Lanka and for Tamil-speaking Canadians and their advocates who want a democratic formula for sustainable prosperity in Sri Lanka and the Tamil-speaking global community. For Canadians, this is an historic opportunity to redefine our foreign policy around things that matter and things we understand, we have long lived with the complexities of identity (“I am a Canadian, I am a Quebecois and I am a North American”). The reconciliation of different cultures in a functioning democratic system is something that Canadians deal with daily (and we take too lightly our success at doing this). It is one of our contributions to the models of global decision-making that make us unique. We are the only member of the G8 with no imperial history. We are also the only member of the G8 that is explicitly about the creation of a multicultural politics in our constitutional design. We are a democratic society which has chosen to spell out the terms of our disengagement in a Clarity Act; we are the anti-Lincolns of the 21st Century. As Bob Rae (*) has pointed out, we have something to offer young Tamils and Sinhalese speaking Sri Lankans by way of our learned and digested experiences with federalism and other complex models for multicultural nation-building. We can at least define the options. It is for Sri Lankans to determine the form of their new political order. The democratic world can only speak declaratively on the rules of the game. We can only assist in framing the options. Federalism can work. The Czech and Slovak partition within a unified Europe provides another option which has proven viable. As Canadians, we know the value of complex multiple identities; we also know the stresses and potential for an economic lack of focus in a federal state without strong national institutions. The Tamil business agenda is as significant as the Tamil political agenda. The need for Canadians with business backgrounds to create the economic instruments which are the prerequisite of longterm sustainable development is more apparent than ever. Just as there is a need to create instruments to provide entrepreneurial finance to innovative Palestinians, there is a need to create these kinds of financial instruments for the development of a new economic structure in South Asia. Cross-border investment reinforces democratic political tendencies. While the realities of capital markets are such that there will and should always be obstacles to complete ease of access, the next stage of economic integration provides for the kind of investment in new growth activities which wealthy counties have been doing for decades. In the previous section the Palestinian Peace fund was citied as an example. The proposal for a northeast African instrument of economic integration, backing business management teams from Somalia, Ethiopia, Eritrea and Djibouti has been discussed previously (see www.jimdewilde.net ) , Such attempts to provide innovative structure for entrepreneurial finance in south Asia are equally important to the sustainable prosperity of the region and the capacity of nation-states to evolve a predictable rule of law. The future prosperity of any multicultural unit and especially one which involves a federal arrangement depends on its capacity to create win-win investment deals between regions. The politics of south Asia depend on the capacity of the capital markets to create export-led competitive strategies of the types which have made successes in Thailand, Korea and Malaysia. Economic integration and the development of well-capitalized export-oriented companies make nation-building easier in multicultural societies. Federalism without a formula for win-win economic decision-making and the development of globally competitive economic strategies is a formula for economic inefficiency, and obviously a corresponding political instability. In South Asia, the already existing Tamil role in e-commerce provides an important component of sustainable prosperity in a knowledge-based south Asian economy http://www.tamilnation.org/digital/singtisc.htm . The Colombo exchange www.cse.lk , existing as it does halfway been Dubai and Singapore, is an incentive to create of win-win economic deal-making, regardless of the constitutional forms that are democratically selected for Sri Lanka and the models of economic integration that are democratically selected for South Asia. The challenge is to develop economic and political strategies for making diversity in Sri Lanka and South Asia a source of competitive advantage. We know that tolerance of the use of political violence disqualifies people from serious participation in the management of complex intercultural politics. We also know that successful management of multicultural societies requires both legal frameworks than facilitate negotiations and economic activities which create the win-win bargains between regional economies. The development of cross-regional commitments to sustainable prosperity remains one of the great political philosophical breakthroughs of the early 21st Century. Even while the European initiative falters in the Netherlands and France, it gains ground in globally-oriented communities in Bratislava and Lvov, Tallinn and Bucharest. For the south Asian region, an ASEAN initiative on creating cross-regional commitments to sustainable prosperity starts with Burma. What could be more relevant to the development of a democratic 21st Century politics than a Tamil-led commitment to the liberation of primarily Buddhist Burma, showing that a commitment to sustainable prosperity, the politics of economic growth and the universality of commitment to the rule of law underlies expressions of Tamil political culture? Tamil politics is either about the attempt to express democratic sentiments through new political forms or the attempt to introduce a narrow sectarianism with a violent trajectory into 21st Century politics. As in northeast Africa, the test is in how the inevitability of regional politics is reflected in the political agenda of aspiring political leaders in Tamil-speaking south Asia. One valid test is how they view the democratization of Burma and the ASEAN agenda for the region. It is not for me to suggest whether a unitary Tamil state is preferable to a federal state, or whether the Scottish, Slovak or Catalonian “models” make the most sense for Sri Lankan constitutional engineering. It is for people like me to say that they want Tami politics to be identified with the best form of 21st Century democratic statecraft and not the worst form of 20th Century political violence. It is also for people sitting learning from the Canadian experience to show that the project of regional integration can be liberating for smaller communities. Catalans and northern Italians with their own regional frustrations embraced the united Europe. The building of economic habits of integration and cross-border investments is not just good for investment bankers. It also develops the economic habits which make possible the management of complex identities in the modern world. How Tamils approach the issues of democracy-building in Sri Lanka and the creation of the conditions for sustainable prosperity in an economically interconnected south Asia can set standards for global politics in the 21st Century. Canadians know about the complexities of multicultural nation-building and can offer some significant political insights into the tradeoffs of different models of constitutional design. Nation-Building and the Complexities of Creating the Organizational DNA of Democracy – When Should Boundaries be Redrawn if Ever? The rule of law starts when there is no fear of a guy with a gun. How do we get to a situation where legal force is stronger than arbitrary force? Throughout the world, the DNA of democracy is created a step at a time: creating a market for protecting endangered species that finances an anti-poaching police force and thereby complies with participation in the Endangered Species Act. These are admittedly small steps, but taken together, they create a tapestry of civil society and a set of incentives for non-corrupt individual behavior. This rule of law is a prerequisite for the kind of economic activity which creates sustainable prosperity. How does the rule of law become established? There is obviously a cultural phenomenon, the habits of consensus-building which are part of many traditional societies, the unscripted natural order of a chaotic highway or an English bus-queue, enforced by learned habits and an incentive to create efficient markets. The process is hard, practical work: developing management capacities for the delivery of essential services, organizing compliance with international trading systems and providing a framework for the peaceful resolution of disputes. It is the result of millions of decisions on the ground which translates into a social network of collective decision-making. But it also requires the political will of the international community to ensure that there is no “guy with a gun” who can misappropriate wealth. Transparency International, an increasingly valuable organization demonstrates (www.transparency.org) a sophisticated approach to assessing levels of corruption and the impact of corrupt governance on economic performance. By simply measuring corruption, it sets a standard for improving behaviour and creates benchmarks and targets for all community to strive for. There are informal tests that we can all use: (a) Are compliance laws, like the endangered species act, enforced? (b) Are serious laws about human rights and due process enforced? (c) Is there widespread petty corruption at the level of bureaucratic transactions? For political scientists, the issues of creating viable democracies have long been central to the development of a meaningful approach to political theory. The debate over democratic state formation is a constant. The question of homogeneity of culture is one raised frequently in debates about the prerequisites for democracy. As Canadians, we have long a familiarity with managing cross-cultural institutions. As Canadians, we have also developed a predilection for economic integration between culturally distinct regions and an aspiration that we can create the circumstance for win-win deals between these regions. This habit is not, however, one which can be applied to all contexts and situations. Few thoughtful Canadians advocated that Slovenia stay in Yugoslavia or Ukraine in the Soviet Union (although that was the orthodox view of the U.S. State department in both cases). The issues of when restructuring post-colonial boundaries requires the design of new states is one which can only be decided by those involved, but proponents of international rule of law have a stake in HOW it is decided. Three political analysts have written in the last decade with special insight into this issue. The first, Jeffrey Herbst of Princeton writes about Somaliland and Somalia. The second, the great Nobel laureate in literature, Wole Soyinka, writes about Nigeria. The third, the Israeli political philosopher Shlomo Avineri, writes about Iraq and the possible desirability of “Three Iraqs”. Each is countries is dealing with the remnants of colonialism and the impact of arbitrarily drawn border-lines. These have resulted in extraordinarily complex issues for government. The issue of the remnants of arbitrary colonial decision needs to be explicitly addressed. Whatever decisions are made, it is unrealistic and inappropriate for the Banquo’s ghost of arbitrary colonial decisions made a century ago to linger and simply be ignored. At a minimum, in designing democratic institutions, proponents of the rule of law and sustainable prosperity need to create mechanisms for regional economic integration that compensate for these past colonial decisions. Avineri is right that there is no magic formula for culturally diverse societies. Each case is separate. The importance is that the debate is conducted democratically and the issues are recognized and addressed. Iraq, Iraqi Kurdistan, Somaliland, Somalia, Nigeria are all complex cases which require different and nuanced discussion. The issues involved here go to the heart of issues of modern security, the creation of “social capital” and economic development. There has been a pattern in U.S. thinking that no matter what the historical circumstances, states should not break up. In this view, partition is always bad in this view and the geographical implications of decolonization are a bit of a lottery. The view was dogmatically enforced until the ending of states called Yugoslavia, Czechoslovakia and the Soviet Union. There has to be renewed interest in designing mechanisms of economic and political integration which allow modern citizens to have multiple loyalties: Quebecois AND Canadian, Catalan, Spaniard AND European, hypothetically Somali-speaking, Ethiopian AND a member of Northeast African Shared Prosperity Zone. The challenges here are enough to keep political science students busy for a generation. Why should Somali-speaking Djibouti be a separate country because of its colonial heritage and Somaliland not? How does one democratically resolve whether Nigeria should remain a single country, whether Turkish Cyprus had a right to resist a military junta in Athens, whether Kurds and Shia Iraqis should share a state with Sunni Arabs, whether Aceh should remain party of Indonesia? These questions will not disappear conveniently for democratic state-builders and would-be architects of global sustainable prosperity. All we can do to answer it is to suggest that as Canadians, we know something about establishing the rules of democratic disentanglement and the challenges of building win-win economic bargains between culturally diverse regions. But the issue cannot go away. Understanding the historical context can alleviate much political tension and create first step to forcing the next generation of decision-makers to acknowledge the past and move on, the past having been acknowledged and not ignored.